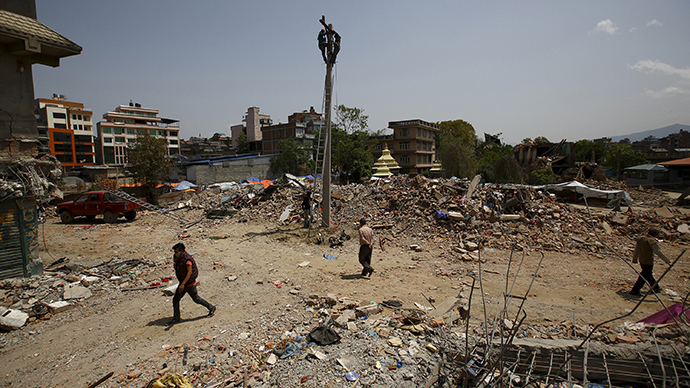 One thousand people from the European Union are missing in Nepal and 12 others have been confirmed dead, the head of the EU delegation said on Friday. The numbers come less than one week after a devastating 7.8-magnitude earthquake struck the country. "We don't know where they are, or they could be," Ambassador Rensje Teerink told journalists, adding that those missing were mostly tourists in the Lukla and Langtang areas. Langtang, a trekking region located north of Kathmandu, was hit by an avalanche and mudslides following the deadly earthquake. Lukla is extremely popular with tourists, serving as a launch point for hikers and climbers aiming to make the nine-day trek to the Everest base camp. Officials from Nepal's Tourism Ministry estimated that at least 1,000 climbers, including around 400 foreigners, were at the base camp or on Everest when the earthquake struck. There have also been reports of avalanches flattening villages in Langtang. Dozens of foreigners have been evacuated from the area, according to local media reports. An EU official told AFP on condition of anonymity that the majority of EU citizens are likely to be found safe, but that their status is unknown due to the difficult terrain and lack of access to the affected regions. Rescuers have struggled to reach remote areas of the Himalayan country, with fighting between tourists and locals hindering efforts to airlift trekkers to safety. Diplomats are also finding it difficult to trace the missing tourists, as many travelers do not register with their nation's embassy upon arrival. Meanwhile, the neighboring countries of India and China reported 78 and 25 deaths within each country, respectively. Four Chinese citizens died in Nepal – two employees of a Chinese company, a tourist, and a mountaineer. Seven Indian citizens also died within Nepalese borders. Many US citizens are thought to still be unaccounted for following the quake, though the US embassy has not provided an exact number or estimates. Four have been confirmed dead so far. One Australian was confirmed dead following an avalanche at the Everest base camp. About 20 other Australian citizens are believed to be missing. Hong Kong, Japan, New Zealand, and the United Kingdom have all reported one fatality each. The overall death toll following the quake has surpassed 6,200. Bodies are still being uncovered, prompting authorities to order the immediate cremation of remains. "Morgues are full beyond capacity and we have been given instruction to incinerate bodies immediately after they are pulled out," Raman Lal, an Indian paramilitary force official working in coordination with Nepali forces, told Reuters. Nepal's Prime Minister Sushil Koirala has stated that the death toll could reach 10,000.